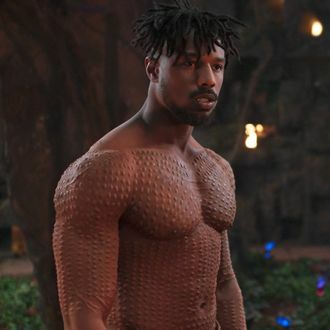 Michael B. Jordan as Killmonger. So his dad was killed by his own brother while Killmonger played pickup basketball outside, and his mom died in prison. Honestly, it’s probably for the best Coogler cut that detail from the story. You already felt so much for Killmonger it was kind of hard to root for T’Challa when his cousin showed up in Wakanda and aired out all of his very legitimate grievances with the country’s foreign policy. Giving him the Disney-special dead mom in his backstory would have pretty much ended any chance of the audience siding with the true king of Wakanda.